Written between 1843 and 1848, A Disquisition on Government addresses such issues as states' rights and slavery and articulates the doctrine of the concurrent majority, today a central tenet of American political thought. 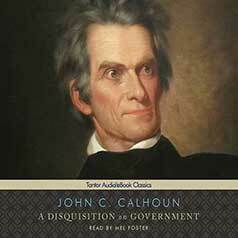 Written between 1843 and 1848, John C. Calhoun's A Disquisition on Government addresses such diverse issues as states' rights and nullification, slavery, and the growth of the federal judicial power. Articulating Calhoun's perspective on government as seen from the point of view of a permanent minority (the South), A Disquisition on Government relies on the doctrine of a concurrent majority. Calhoun's concurrent majority captures the idea that because unchecked majority rule can lead to tyranny over minority interests, minority groups should possess veto power government actions that affect them. Although Calhoun primarily intended this doctrine as a justification for slavery, the broader idea of a concurrent majority as a protection for minority rights has since become a pillar of American political thought.